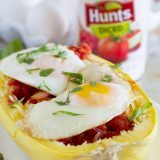 Inspired by a popular Mexican breakfast, this Huevos Rancheros Inspired Spaghetti Squash has all of the flavor of the popular Mexican meal with less carbs! This post has been sponsored by Hunt’s tomatoes. All opinions are my own. Is there one item that is in your pantry or food storage that you always keep stocked? 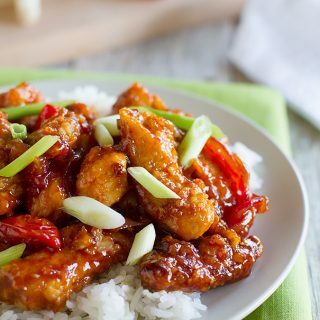 One item that always helps pull together a last minute dinner? For me, that item is canned tomatoes. Which is why I am super excited to be working with Hunt’s Tomatoes as one of their ambassadors! It is seriously a match made in heaven, because I use canned tomatoes and tomato paste all. the. time. So really – there’s not a better match. This past week, I was able to take a quick trip to New York City to watch a demonstration of an at-home steam peeling process similar to the FlashSteam™ process Hunt’s uses a process to peel their tomatoes. 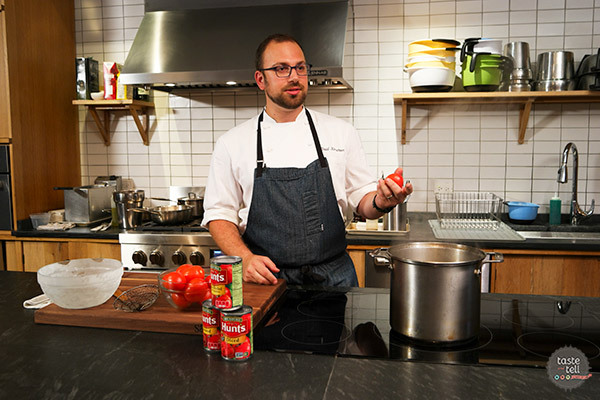 Before learning about Hunt’s, I assumed that all canned tomatoes were processed the same way. Well, come to find out, many other brands use chemicals, such as lye*, to peel their tomatoes. Instead, Hunt’s uses a 100% natural process they call FlashSteam™, which not only eliminates the chemicals from being used for the tomatoes, but it makes it so that there are no chemical by-products that get put back into the earth. Growing up, we always had a garden. With lots and lots of tomatoes. My mom was great at canning and preserving, and every fall, she would can jars and jars of tomatoes. When she would prepare the tomatoes, she would peel them by dropping them in boiling water, followed by ice water. The peels will then slide right off of the tomatoes. The FlashSteam™ process that Hunt’s uses is similar to the process that my mom did growing up, just on a larger scale. I want to feel good about what I feed my family, and this FlashSteam™ process is definitely something I can feel good about. 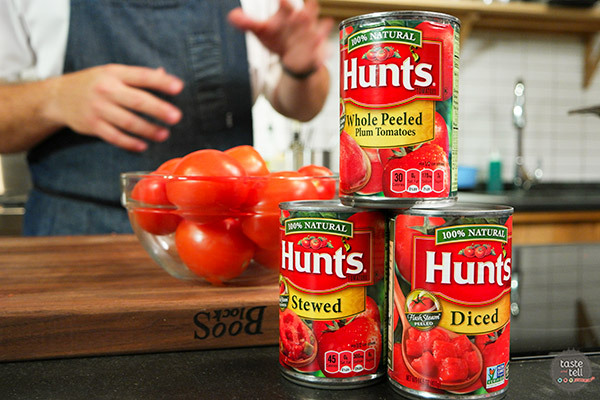 I also love that Hunt’s tomatoes use non-BPA lined cans. And beyond all of that, they taste fantastic because the tomatoes are picked at the peak of ripeness and canned within hours of being picked. I knew there was a reason I always loved Hunt’s tomatoes!! I’m going to have fun sharing lots of tomato-inspired recipes with you all in the coming months. Starting with this Huevos Rancheros Inspired Spaghetti Squash. 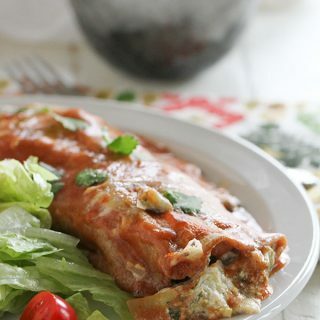 You all know that I’m a lover of anything with a Mexican food twist. Huevos Rancheros are one of my favorites. It’s one of those dishes that I always order when it’s on the menu. 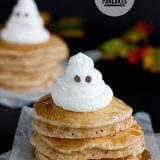 But I decided to give it a little seasonal twist, because, well, we all know I like to change recipes up a bit!! I know that traditional Huevos Rancheros are made with tortillas. 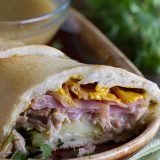 And those tortillas are traditionally a very important part of the recipe. Well, it’s a good thing I’m not a traditional girl. Squash is in season (yay!!) and I go crazy for spaghetti squash. Well, all squash, but I love that you can turn spaghetti squash into a full meal. 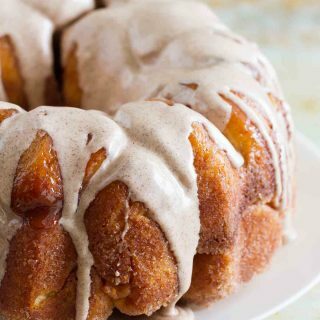 And while I’m not watching my carbs, I do try to eat in moderation most of the time. 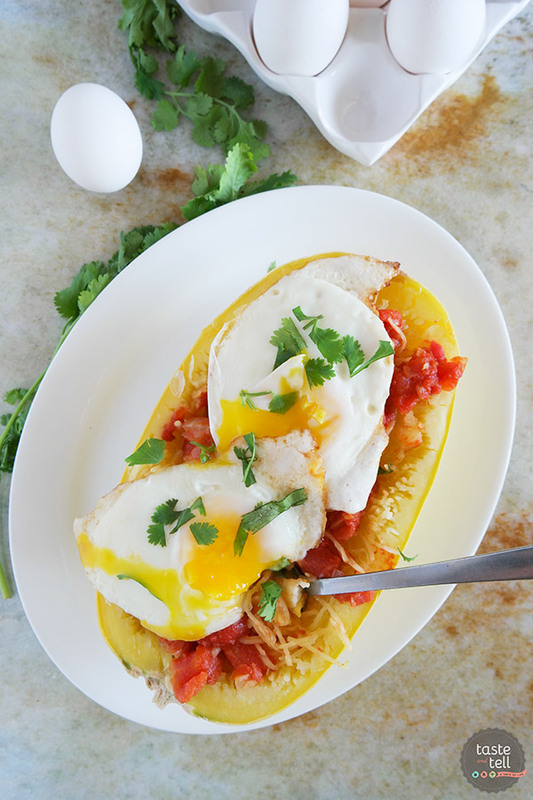 And this Huevos Rancheros Inspired Spaghetti Squash is a great way to get those delicious Mexican flavors with a lot less carbs. I start by cooking the squash. I have cooked spaghetti squash many different ways before, but the method I turn to the most is cooking it in the microwave. I like it because it keeps the squash nice and al dente. Cooking it through, but letting it retain some texture and shape. Then you make a quick sauce with Hunt’s diced tomatoes, onion and some spices. Mix that sauce into the squash, then top it off with a couple of runny fried eggs. Pure heaven, I tell you. I say this is 2 servings, with each serving being half a squash, but they are large servings. I couldn’t even finish mine. But if you want to make smaller servings, you can scrape the spaghetti squash into a casserole dish and mix the tomato mixture in. Then serve each serving with an egg. I’m super excited for the months ahead with Hunt’s tomatoes – especially if they all look this good! 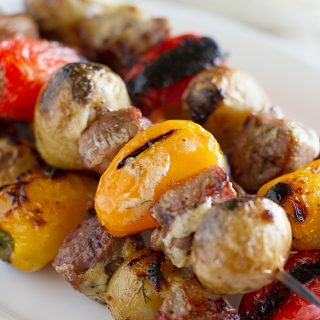 Follow Hunt’s Tomatoes on Facebook, Pinterest and Twitter for even more great recipe ideas! *Lye peeling is generally recognized as safe by the FDA and has not adverse effects on the healthfulness of tomatoes. Cut the squash in half lengthwise with a sharp knife. Scrape out the seeds and discard. Place the squash halves cut side up in a microwave safe dish. Add about ½ inch of water to the dish and cover with plastic wrap. Microwave on high until the squash is soft, about 10 minutes. Remove and let cool slightly, then with a fork, scrape up the strings from the flesh of the squash. Meanwhile, heat the olive oil in a skillet over medium heat. Add the onion and cook until they are translucent. 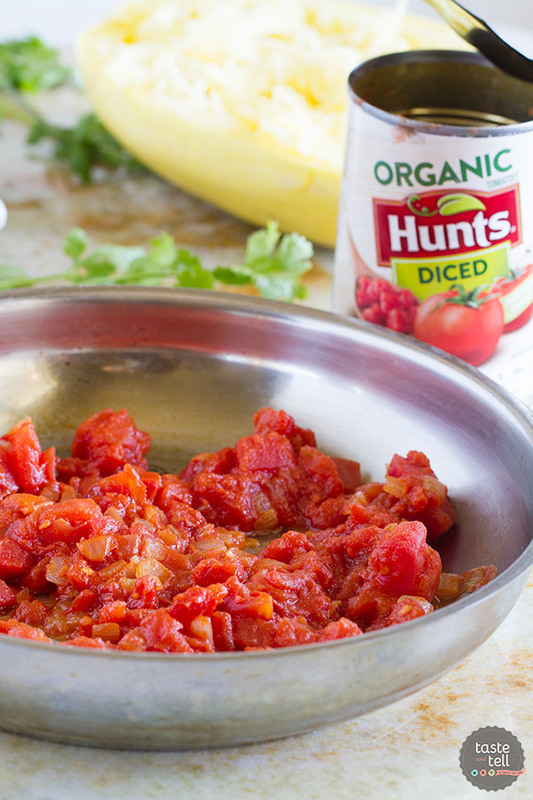 Add the Hunt’s Organic Diced Tomatoes. Season with the salt, chili powder, and cumin. 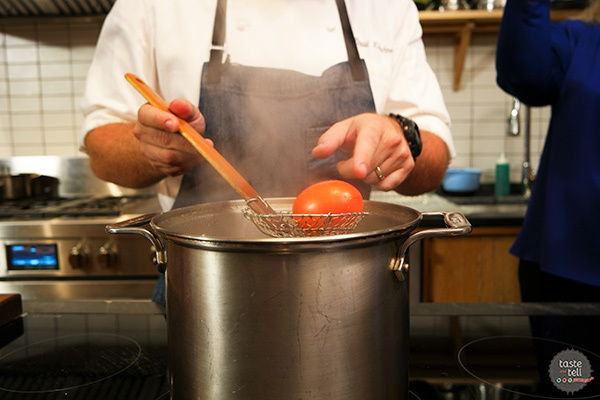 Bring to a simmer, then reduce heat and let the mixture simmer for 5-8 minutes. Melt the butter in a small skillet over medium heat. Crack the eggs into the skillet. Cook as desired. To serve, mix half of the tomato mixture into each of the spaghetti squash halves. Top each half with 2 of the eggs. 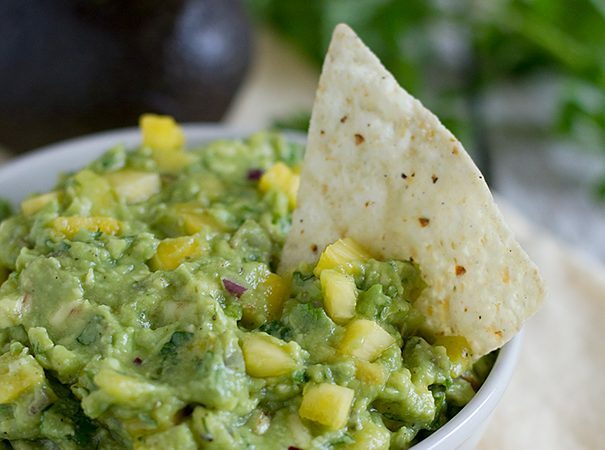 Sprinkle with fresh cilantro. *if desired, you can scrape the spaghetti squash into a serving dish and stir all of the tomato mixture in. 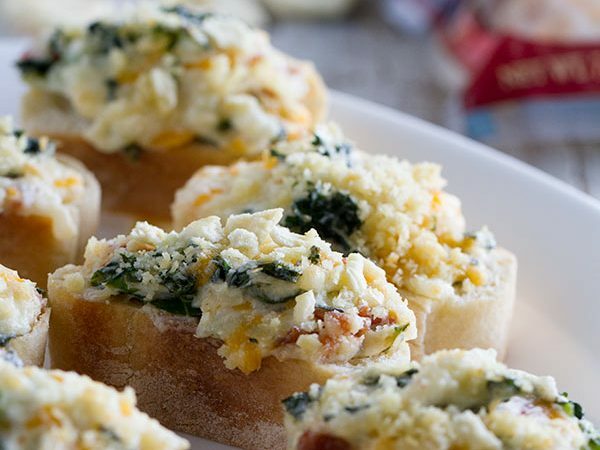 Top each serving with the fried eggs to serve. Deborah, this is interesting read today! I have always loved Hunts’ products the best mostly because of taste. 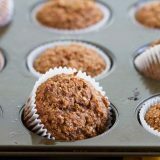 I remember peeling tomatoes and peaches in the boiling water/ice cold water method as a young girl – it does explain why they taste so good by passing on the chemicals. Good to know! 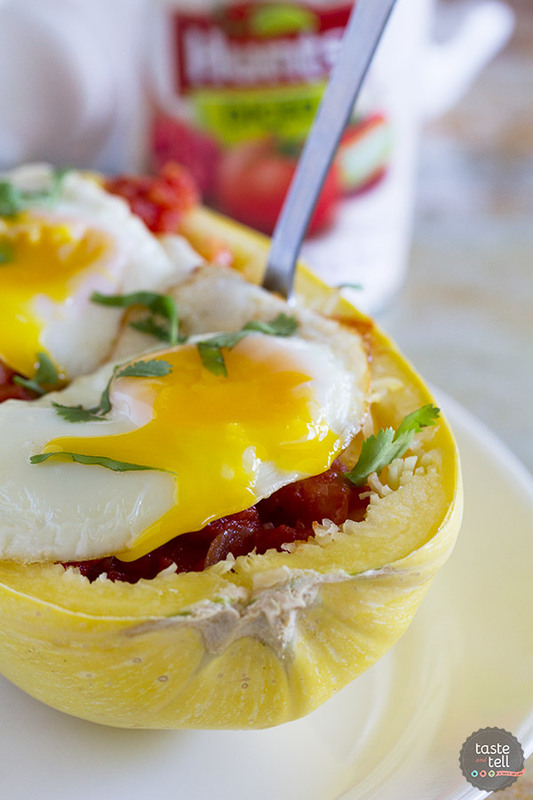 This recipe – low carb, spaghetti squash, tomatoes and eggs – what is not to love?! Pinning and making. Thank you! I love this! 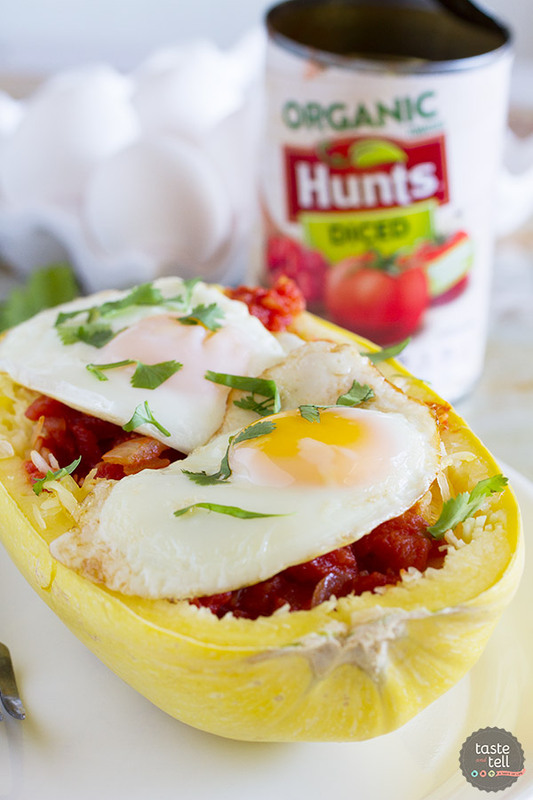 First of all, love spaghetti squash and Huevos Rancheros…what a perfect twist! But I really do love Hunt’s products too. Really good quality tomatoes.